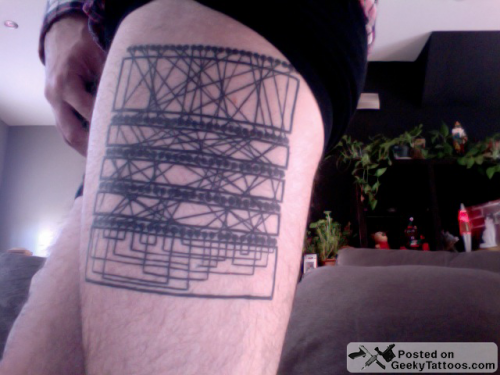 This is a tattoo I designed based on the wiring diagram from the Enigma Machine that was supposedly uncrackable, and used to encode messages during the second world war. The British mathematician, Alan Turing, cracked the code. Tagged with Alan Turing, cryptography, Enigma Machine, leg, thigh. Actually it was first cracked by Polish Cypher bureau in 1932, not by Turing. Turing helped re-crack it but more importantly came up with the bombe, a machine for decoding it much faster based on a polish idea. Enigma was cracked by polish mathematicians including 3 maths students Rejewski, Różycki and Zalewski. They broke the code and actually made machine called Enigma bomb consisting of 6 enigmas and Zalewski’s cards that was able to encrypt key in 2 hours instead getting 100 people working. Bomb was a project of Marian Rejewski. Work of Alan Touring’s group was based on polish data and modified bombs, and was a response to german change in cripting method and low budget of Poland, which couldn’t afford to continue work without help.